Exciting Announcement & A Free Gift! 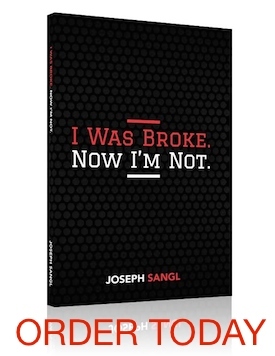 I am so EXCITED to announce that we have launched our brand new I Was Broke. Now I’m Not. website! This is so exciting for us because it is much more user-friendly, and allows us to serve each of you better as you pursue your next financial steps. We hope that you will take a few moments to review the new website and that you save $1,000 by applying the money saving tips. PS: The first 100 people who take advantage of the free webinar offer will also be entered into a drawing for free gifts – like IWBNIN T-shirts, books, and resources. Can you tell that we are FIRED UP? The webinar says page not found so I can not access it. Will keep trying. Joe, you guys do Work that Matters! I LOVE LOVE LOVE it, keep it up!! It’s asking for a password….I don’t have one. What do I do? Web site was confusing. Couldnt get to where I wanted to. Tried to register and it kept wanting a password for a video?? Check your e-mail for the password. Joe may have already e-mailed you too.